For their own house in Holmby Hills, Calif., the Hadids worked with architect Richard Landry on the 20,000-square-foot mansion, and then Yolanda Hadid drew on her hotel experience to complete the decor. 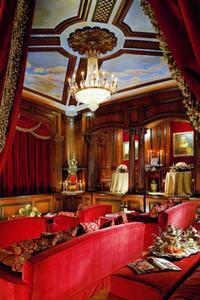 Yolanda, who is Dutch, took her inspiration from Russian and French theaters for the 28-by-20-foot screening room. The raised loge that overlooks the room is reminiscent of the private boxes at opera houses, and the Hadids typically seat guests at the round tables so that they can dine while watching a movie. The paneling and Russian columns in mahogany and walnut and the burgundy Belgian velvet fabrics were intended, she says, to create a warm family room. “My husband and our three small children can hop on the couches, or he and I can spend a romantic evening alone—it can go both ways.” The chandelier came from an old French estate. Among the antiques are a Chinese Buddha, which sits in a corner; crystal decanters; a silver tea service; and European oil paintings. DSI Entertainment Systems of Sherman Oaks installed the audio/video equipment. It is a sumptuous space that raises the art of watching movies to a new level.